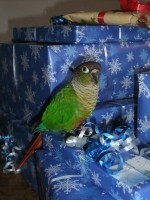 Green Cheek Conure answers to Gandalf or Squeaky Beak. Flew off approximately 3:45pm Dec. 18, 2012 from the Compton Meadows complex in Kingsgate, Kirkland, WA. If found please call @ 425-870-2583.